Scuba Divers - Help save these majestic creatures before it is too late. Save-the-Mantas.org and The Manta Network intends to fund research activities through a combination of corporate sponsors, research grants and the distribution of media produced in conjunction with research, education and protection activities. If you can assist in this program or can help secure research funding, please contact Robert Aston, Director, The Manta Network at 831-426-4400 or aston@save-the-mantas.org. The principal objective of The Manta Network is the conservation and protection of manta and mobula rays worldwide. The principal objectives of The Manta Network fall into four areas: population studies, environmental education, environmental assessment studies and public awareness initiatives. Our initial efforts have focused on population studies and environmental education employing the Internet. As these programs progress, it is our goal to use the gained understanding to identify strategically important areas. These areas could then be routinely monitored to provide the most valuable information to access population health. Local action programs can then be fashioned to increase awareness and provide alternatives to overfishing. Manta rays divide into two distintive groups based on their markings. 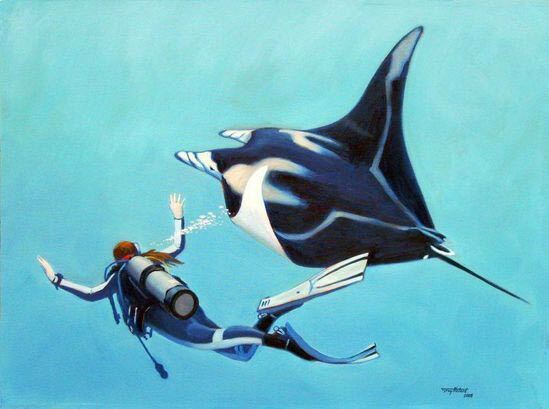 The Chevron Manta can be identified by the white shoulder bars and V-shaped marking near the tail and Black Mantas are all black on the dorsal side (back). If the animal has white shoulder patches on its dorsal surface (Chevron Manta), the ventral surface is premoninantly white with dark splotches on the belly and behind the gill openings. The Black Manta is all black on its dorsal surface. Generally, if the manta is all black on its dorsal surface, the ventral surface is also black with a white central blaze. Mobulas are related to Manta birostris but are smaller. In addition to their size, mobulas have smaller cephalic fins and their mouths are located further back than Mantas.